The townland of Rathwire is situated a few hundred metres south of Killucan in Westmeath. According to legend the name is derived from the Chieftain Guaire who established a hillfort here. The remains of the earthworks can still be viewed. The Norman Lord Hugh de Lacy built a motte on the same hill in the 12th century. De Lacy, 1st Lord of Meath built a number of castles throughout Ireland including the one at Trim. 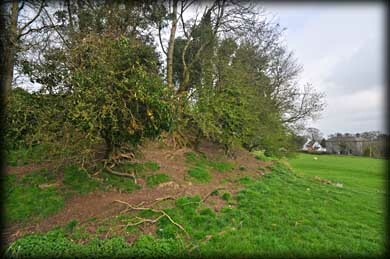 The flat topped motte is in excellent condition and the remains of the bailey can be seen extending southwards from the motte. The best view of the motte is from the northside, where the fosse is more pronounced. 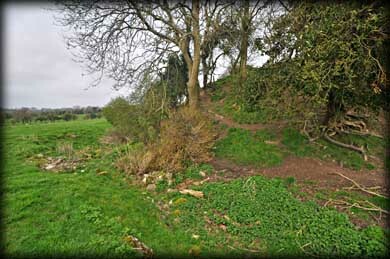 The image above was taken from the southside and clearly shows the extent of the bailey with the motte in the background. About 200 metres north of here at Killucan is an enclosure with the shafts of three wayside crosses and a bullaun. Situated: From Killucan head west on the R156. When the road bends right for Mullingar (Signposted) you ignore this and go straight on for about 200 metres. The motte is on your right. Discovery Map 42: N 5657 5141. Last visit April 2014.